Hong Kong, April 7, 2016 – QIMA, a leading global quality control and compliance service provider that partners with brands, retailers and importers around the world to secure, manage and optimize their supply chain, today announces its 2016 Q2 Barometer, a quarterly synopsis on outsourced manufacturing and the quality control services industry. The year 2016 begins with shifts in global trade, ongoing quality issues, and a host of ethical challenges: from structural risks accompanying expansion in Egypt, Bangladesh, and Vietnam, to skyrocketing forced labor problems in Turkey. As the end of the quarter wraps up the first reporting period under the UK's Modern Slavery Act,1 consumer and government scrutiny on global supply chain continues to increase. Consistent with these trends, QIMA has seen growing demand for structural and ethical audits, using additional methods to zero in on forced labor in particularly high-risk areas. Even more than the slowdown some economist predict,1 the major event for global trade in 2016 may well be the start of a rebalancing and shift in merchandise flows. A prime example of that is Brazil, whose imports from China, its biggest trading partner, plummeted by 60% YoY in 4Q2015.2 At the same time, Brazil's containerized exports to China and the rest of Asia rose, taking advantage of the depreciation of the real. According to QIMA data, the number of inspections in Brazil has tripled in Q1 2016 compared to Q1 2015 – but at the same time, the 13% increase in Beyond AQL rates may signal growing quality problems. Meanwhile, as Vietnam and Bangladesh remain the fastest export growers among the US' top ten trading partners in Q1 2016, structural risks run high in both these locations.6 QIMA data shows Vietnam as the highest-risk country for structural issues, with 71% of structural audits assessing facilities as "at risk" or "need improvement." Many of these faults are caused by unauthorized expansion of factory premises or unauthorized additions. In Egypt, where apparel exports have slumped since the 2011 revolution (some 13% decrease in exports to the US, its main market),12 new opportunities for recovery come with the inflow of many manufacturers from Turkey and, notably, Syria.13 Safety remains a consideration: in Q1 2016, Egypt showed the greatest growth of structural audits outside Asia, and 50% of QIMA structural audits revealed that facilities are at risk or need improvement. The movement of Syrian refugees also resulted in a dramatic spike of forced and child labor in Turkey's RMG sector. 14 Being the world's third largest apparel sourcing hub and the largest host of Syrian refugees makes Turkey a location where monitoring is complicated, and exploitation of vulnerable groups all too easy. Demand for ethical audits increased appropriately, with a threefold YoY increase in Q1 2016 vs. Q2 2015, according to QIMA data. As buyers put a special focus on tracking down forced labor at Turkish factories, QIMA uses additional methods to tackle the problem – such as unannounced ethical audits, and 30-day "monitoring missions" by social compliance auditors. As apparel brands feel the pressure to improve quality and safety, QIMA has seen increased scrutiny on specific product safety issues – including metal control detection (ensuring no unwanted – and potentially dangerous – piece of metal is left on the garment, as can be the case when sewing needles break during production). Previously, apparel brands and retailers tended to limit metal control to particularly safety-critical product categories, such as baby clothing and underwear. 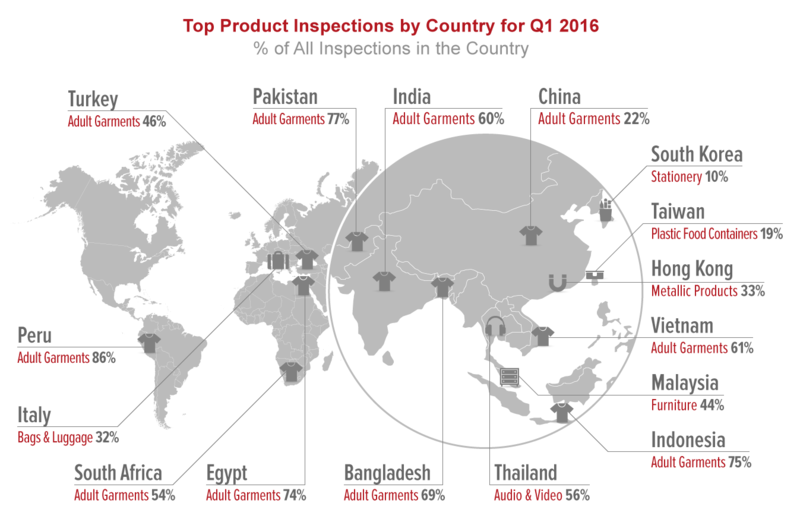 In Q1 2016, QIMA observed a sharp increase in demand for this service, as many brands implement metal control as standard procedure across the entire range of garments. The brands' concerns may be justified, as 87.5% of metal control audits in Q1 2016 showed improvements were required. QIMA is a leading global quality control and compliance programs provider that partners with brands, retailers and importers around the world to secure, manage and optimize their supply chain. With unique web-based and mobile quality control management, QIMA offers Product Inspection, Supplier Audit Programs and Laboratory Testing services for more than 5,000 clients worldwide. 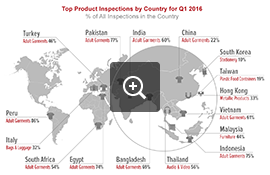 The 2016 Q2 Barometer is a quarterly synopsis on outsourced manufacturing and quality control services performed by QIMA each year (product inspections, supplier audit programs, and laboratory testing).